Children with autism mature into adults who want to attend college, work, and have a social life. What services are needed to help them achieve these milestones? Every day we see or hear another story in the news, on television, on the Internet, or in a popular magazine about issues related to children with autism. Awareness is growing, and more research is helping parents better understand their children’s unique behaviors and needs. Healthcare, education, and social services offer options for parents of young children with autism that did not exist years ago. But what happens when children diagnosed on the autistic spectrum grow up? Increasingly, parents of older teenagers and young adults are seeking assistance for transitioning to adulthood, and adults who have grown up with an autism diagnosis or who may be newly diagnosed are facing challenges with employment, social relationships, and daily living. According to Pamela Dixon Thomas, PhD, LP, a psychologist with the University of Michigan Autism and Communication Disorders Center (UMACC), adults with autism face challenges that children with autism often do not. “Adults face discrimination that comes from a lack of understanding about autism. The tolerance that is extended to children with autism is often lacking,” she notes. Although autism is receiving substantial attention in the scientific community and from the press, adult autism and related issues have been neglected. “Most media attention focuses exclusively on young autistic children while commonly ignoring autistic adolescents and adults,” says Scott Michael Robertson, an autistic self-advocate in Pennsylvania and vice president of the Autistic Self-Advocacy Network (ASAN), an international autistic-run organization dedicated to expanding societal acceptance, community understanding, and support resources for individuals across the autistic spectrum. Robertson is also a doctoral candidate at Penn State University researching how online communities can empower autistic self-advocates to collaborate with educational professionals on developing autistic-specific accommodations and transition resources for autistic college students. Robertson questions the societal wisdom of providing early childhood educational services to autistic individuals while neglecting the needs of those individuals during adolescence and adulthood. “Few specialized state and local resources exist to help autistic people navigate the challenges they will encounter in adult life—postsecondary education, employment, interdependent living, housing, etc.,” he says. Depending on the severity of symptoms, required resources and services may range from long-term residential care or supervised day care to vocational counseling or social skills development. Young adults on the autistic spectrum may qualify academically for college but not be able to handle other aspects of college life. Older adults may experience continued challenges in maintaining successful personal relationships, physical stamina, and regular employment expectations. Given the current inadequacies in services, many opportunities exist for social workers to improve and expand the services available for adults on the autistic spectrum. Our society views autism as a disease and severe disability, but adults with autism and professionals working with them seek to change that misperception. “Society is not autistic friendly,” says Robertson, who considers gaining societal acceptance of autistic adults’ differences a key challenge. As a result of his personal experiences, Robertson is helping other autistic individuals recognize their individual strengths and challenges to build a healthy self-esteem and sense of self-worth. As an active autistic community advocate, Robertson mentors autistic adolescents and cofounded a social support group for autistic teens in State College, PA. Through his leadership positions in organizations such as ASAN, the Autism Higher Education Foundation, and the Asperger Syndrome Alliance for Greater Philadelphia (ASCEND), he is helping debunk myths about autism. Robertson cites the case of Nate Tseglin, an autistic teenager, as an example of how misperceptions about Asperger’s syndrome and autistic challenges can lead to mistreatment and abuse. At age 14, Nate was multilingual, graduated with honors from middle school, and received an award for excellent behavior and citizenship. When Nate was 17, a high school teacher called child protective services after seeing self-inflicted scratches on Nate, who had asked the teacher to help him with soft restraints prescribed by a doctor to help manage his anxiety. Nate was forcibly removed from his home, placed in an institutional setting, and heavily medicated against his and his parents’ wishes, and his parents were denied visitation and access. ASAN provided legal support and advocacy for Nate’s family and was instrumental in having Nate released and returned to his family (visit www.getnatehome.com for more information). “Unfortunately, Nate’s experience is becoming the norm rather than the exception in a world that does not adequately accept, understand, or support autistic adults,” Robertson says. In addition to fighting misperceptions, adults on the autistic spectrum must also face challenges of employment, postsecondary education, housing, social relationships, and healthcare. Robertson and Dena L. Gassner, MSW, director of the Center for Understanding and an advisory board member to the Autism Society of America, have personally experienced some of these challenges and continue to help other adults with autism through their work. Gassner explains that an adult with Asperger’s may be a superior employee in task completion and job knowledge but cannot understand the social behaviors expected by others in the workplace. In other cases, the physical environment of the workplace may present daily challenges. “Sensory overload causes problems for many adults with autism. The fluorescent lighting and noise from other workers may make it impossible for them to work a full day in such an environment. Long-term employment, therefore, is often difficult for adults with Asperger’s and other diagnoses on the autistic spectrum,” says Gassner. Robertson adds that while exact statistics on employment for autistic adults are not known, underemployment (the underutilization of skill set, knowledge, and job experience), as well as unemployment, are huge barriers limiting autistic adults. “Many autistic adults have college degrees and, in some cases, graduate degrees, but they are not working in the field of their degree,” he says. Difficulties with social cognition (the ability to understand social cues) often can prevent adults with autism from participating in community activities and functioning in a job suited to their skills and knowledge. Better interventions are required to help them develop skills to understand social interactions, but resources are currently inadequate, especially in employment. An innovative community program is helping young adults with autism improve social cognition with the hope of improving opportunities for employment and community involvement. Jonathan J. Kaufman, PhD, is codirector of the Adaptations program at the Manhattan Jewish Community Center (JCC) and founder of Disability Works, Inc., a consulting company that helps corporations, government organizations, and educational institutions develop strategies and initiatives to improve the quality of life for people with disabilities. Kaufman helped launch Adaptations, the first initiative of its kind in the United States serving young adults in their 20s and 30s who have learning disabilities and/or are on the autistic spectrum. The program develops social skills and job strategies and provides social events, including social skills groups, cultural events around New York City, lounges, dinners, and use of the JCC facilities for activities from photography, cooking, and fitness to integrated programming with other young adults. “One of our cornerstone programs is our social skills curriculum where we teach tools for dealing with certain social situations, ranging from friendships to workplace etiquette to basic communication skills,” says Kaufman. Another component of Adaptations is career exploration and development. For program participants who are ready for a competitive employment environment, one-on-one career and skills assessments are provided, along with group discussions. Kaufman has seen Adaptations work wonders for some participants. “One of our greatest successes is to see that meaningful friendships have been fostered beyond the parameters of the program. A perfect example is one of our members who had very few friends, and most of her social life revolved around her parents. Since joining the Adaptations program, she has truly blossomed, made friends, and has nurtured those relationships so that her social calendar is constantly busy. She has become such a proponent of the program that she now acts as the ‘official ambassador’ of the program by reaching out to new members,” he explains. “Autistic adults may be finding the college experience daunting because of widespread lack of specialized services and accommodations for them on campuses,” says Robertson. Few programs in the United States provide support—living arrangements, social skills, and study skills development—for college students with autism, says Marci Wheeler, MSW, of the Indiana Resource Center for Autism at the Indiana Institute on Disability and Community. Wheeler has 25 years of experience working with teenagers and adults with autism and has established long-term relationships, working with one family since their now 28-year-old child was 7. Wheeler sees deficiencies in services available for young adults with autism; however, she believes resources are growing as this population continues to increase. “Lack of employment opportunities is the biggest tragedy. Regardless of IQ, autistic adults can be very good workers. Our society is not tapping into their special abilities, like math, music, and computer skills,” Wheeler says. Better vocational services, she says, will give adults on the autism spectrum strategies to help adjust to the workplace. She believes better understanding about autism and Asperger’s syndrome will help employers take advantage of the special skills and talents that these individuals can bring to a job. One of those resources is the Achieving in Higher Education With Autism/Developmental Disabilities (AHEADD) program at Carnegie Mellon University in Pittsburgh. AHEADD is a private, community organization that supports students in higher education with learning disabilities, diagnoses on the autistic spectrum, nonverbal learning disorders, and attention-deficit disorder. Originally developed in cooperation with Equal Opportunity Services of Carnegie Mellon University, AHEADD is specifically designed to address students’ inherent social, communication, and organizational issues and helps students develop individualized strategies to manage their college careers independently. “Unlike many other programs for students with autism spectrum disorders in higher education, the AHEADD model can be applied within any campus environment and tailored to meet the unique needs of each student,” says Carolyn Komich Hare, MS, founder and director of AHEADD. Recently, AHEADD opened new offices in Dallas; Albany, NY; and Washington, DC. Students involved with AHEADD have professional staff support, peer mentors, access to a campus and community support network, and assistance in utilizing campus resources. “Aside from the inherent social challenges, I believe the most critical challenge for young adults with autism is finding and keeping jobs that are commensurate with each individual’s true potential and area of interest. This is true even for those autistic adults who successfully complete a college degree,” Hare says. One of Hare’s early success stories was Valerie Kaplan, profiled in a 2006 New York Times article on services for college students with autism. Kaplan, who scored a perfect 1600 on her SAT exam, floundered in her sophomore year at Carnegie Mellon, having difficulty navigating the complexities of college life and interacting with students and professors. Hare acted as Kaplan’s coach for the next two years by helping her organize her academic assignments, buy groceries, and improve her housekeeping skills. Kaplan graduated in 2005 and went on to manage an electronic games store. Hare went on to create the AHEADD program. According to Paul T. Shattuck, MSSW, PhD, an assistant professor in the George Warren Brown School of Social Work at Washington University in St. Louis, research on the care and support of adults with autism is severely deficient. “The bulk of research has focused on basic behaviors and genetics, not policies for care. There is a real gap in what we know about support across the lives of these individuals and how to best create systems of care for the long haul,” Shattuck notes. “Since 1994, fewer than 150 peer-reviewed journal articles in the autism research community have examined such issues as employment, college and postsecondary educational transition and support, housing, peer victimization, romantic relationships, and anxiety/depression,” Robertson adds. In stark contrast, research studies on children with autism number in the thousands. More funding for adult studies is necessary since funding for scientific research from autism-related nonprofit associations and government organizations focuses on physiology, genetics, and early educational support for children with autism, while generally ignoring issues and challenges faced by teens and adults with autism, such as educational support and employment. Shattuck, one of the few researchers examining issues related to aging on the autistic spectrum, recently published a study documenting changes in symptoms and behaviors in adolescents and adults with autism. One of the study findings is that the core challenge of social cognition is a common thread across the autistic spectrum. Gassner believes the field of services for adults with autism is exploding, and there is a huge demand for properly trained social workers. Social workers will need to become more knowledgeable in the diagnostic spectrum for pervasive developmental disorders and co-occurring conditions. “When you see an adult who has been treated for ADHD [attention-deficit/hyperactivity disorder], depression, learning disabilities, and anxiety with no success, one must consider that they may have a developmental disorder and send them for an appropriate assessment,” she says. In addition to a better understanding of diagnostic criteria, social workers must also realize that every client with autism will exhibit different skills, behaviors, and challenges. Gassner notes, “A commonly heard phrase in the autism community is, ‘If you have met one person with autism, you have met one person with autism.’” For social workers in this field, comprehending the issue of heterogeneity is an absolute must. “Just because you know the diagnostic label on the autistic spectrum doesn’t mean you know much of anything about that individual walking through your door,” Shattuck emphasizes. Because each individual will be different in terms of his or her level of communication skills, social cognition, and other behaviors, individualized assessments and interventions are critical. Professionals working with adults with autism can help by first discovering the strengths and weaknesses of the individual and then developing a treatment plan that focuses on areas in need of attention. “Since autism is such a heterogeneous disorder, individualized treatment is paramount. For example, one person may have a successful career but find it difficult to engage in social conversation. Another person’s difficulty might be poor organization and planning skills that impact job performance,” explains Robertson. In addition to individualized assessment, other skills that will help social workers in this field are case management experience and adeptness as a liaison with healthcare professionals. A key role for social workers, according to Shattuck, is in helping individuals with autism and their families navigate different care systems. Adults with an autism diagnosis will be involved in many different systems of care, including vocational rehab, medical treatment, and mental health. Wheeler receives many calls from parents whose children are 18, realizing that school is ending, and who have no plans for life after school. “They realize they may be facing a situation when their son or daughter finishes school that they will now be at home with nothing to do because no further plans beyond school have been made. Or, unfortunately, there may have been plans made, but access may be limited to programs for young adults who need more intense supervision and training components,” she says. Transition planning resources may be available from state disabilities or autism service organizations or from the school’s individualized education plan for the student with autism. Schools may have a transition coordinator who can assist with finding support services after graduation. For families with young adults who cannot live independently, residential programs and guardianship may become an issue when the child reaches 18. The need for counseling and assistance services for adults newly diagnosed on the autistic spectrum is also rapidly growing. “The Internet has really created more awareness of the symptoms of autism, which is in turn resulting in more adults realizing that they may have Asperger’s syndrome or another pervasive developmental disorder,” Wheeler says. She has worked with adults who, after reading information on the Internet, recognized that they or their spouse has an autistic condition. Wheeler has coauthored a book titled ASD and Non-Spectrum Marriages: Non-Spectrum Partners Speak Up About the Challenges and Successes with the hope that it will be a resource for adults with relationship issues associated with a new autism diagnosis. For social workers with experience in autism services, and for those interested in joining this burgeoning field, there are many important opportunities in addition to the traditional roles in counseling and case management, says Robertson. “Social workers can organize self-advocacy training sessions for autistic adults in conjunction with autistic-run organizations. They can lead community-organizing activities designed to educate local communities about autistic adults and to expand and strengthen community support resources and they can work to establish mentorship pairing for autistic teens and adults,” he says. — Jennifer Van Pelt (formerly Sisk), MA, is a Reading, PA-based freelance writer with 15 years of experience as a writer and research analyst in the healthcare field. She has written on depression, attention-deficit/hyperactivity disorder, schizophrenia, mental wellness, and aging. When someone says, “My son has autism,” many of us expect to see a child who rocks back and forth, does not speak, and is mentally handicapped. However, we may, in fact, see a child, teen, or adult whose outward appearance and actions are what we consider “normal,” who can play any music by ear but cannot solve a simple math problem. The term autism has been used to lump together a group of three pervasive developmental disorders: autistic disorder, Asperger’s syndrome, and pervasive developmental disorder/not otherwise specified (PDD/NOS). Although there are hallmark criteria to be diagnosed with a PDD—deficits in communication/language skills, social cognition issues, and repetitive behavior or unusual preoccupation—there is a large range in the variability of how these criteria are expressed in the individual. And there is disagreement in the academic and professional communities regarding how to apply criteria for diagnosis. Traditionally, the most severe variant, autistic disorder, has been characterized by profound mental retardation and a lack of verbal language skills. Asperger’s syndrome is characterized by normal language development, normal to above average IQ, some type of issue with social skills and social cognition, and a stereotypical pattern of behavior or preoccupation. PDD/NOS has some symptoms of autistic disorder and/or Asperger’s syndrome, but strict criteria for those conditions are not met. However, recent research is disputing the co-occurrence of mental retardation and autism. The descriptive phrases “high functioning” and “low functioning” are also commonly heard. However, these descriptors have been adulterated, says Dena L. Gassner, MSW, director of the Center for Understanding and an advisory board member to the Autism Society of America. “The phrase ‘high functioning’ was initially intended to separate those with IQ scores indicating mental retardation. Now, ‘low functioning’ is generally used to refer to those with autistic disorder who require substantial assistance in all domains and ‘high functioning’ to refer to those with Asperger’s and PDD/NOS who may appear to have limited issues with social interactions and behaviors, but in reality, they too suffer with the organization and planning of self-care and basic skills.” She questions whether someone who cannot communicate but graduates college with honors is truly low functioning, and similarly, whether someone classified as high functioning but cannot remain employed or sustain relationships is really high functioning in our society. The phrase autistic spectrum is now being used more frequently to reflect these individual variations, so an individual may be described as being diagnosed on the autistic spectrum. “The phrase ‘autistic spectrum’ is not an official clinical term, but rather a colloquial term that has been adopted to refer to the recognition of symptoms that occur on a continuum of severity,” explains Paul T. Shattuck, MSSW, PhD, an assistant professor at the George Warren Brown School of Social Work at Washington University in St. Louis. “The heterogeneity on the autistic spectrum is enormous, which makes it so challenging from the standpoint of developing best practices for care. There is no good way of thinking or talking about these levels of severity in a systematic way. The severity of symptoms will determine the challenges faced in adulthood,” he says. The Autistic Self-Advocacy Network is working to change the language used to describe autistic individuals, preferring that the phrase “adults with autism” be replaced by autistic adults or adults on the autistic spectrum. “We also look to discourage usage of phrases that do not realistically express that autism brings a combination of neurologically diverse strengths and challenges—descriptors like suffering, impaired, afflicted, disordered, and defective,” says Robertson. For more information, visit http://web.syr.edu/~jisincla/person_first.htm. 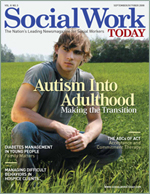 Editor’s Note: Social Work Today currently uses “person-first” language (e.g., adults with autism) commonly accepted in the social work profession. However, Mr. Robertson’s quotes and text related to his statements reflect his preference in autism-related language.